The red (or other colored) ellipses represent our uncertainty about the spacecraft's trajectory. We took our best estimates of the trajectory at various times prior to landing and the errors associated with them and propagated these data forward to the point of atmospheric entry. We then took the dispersions in the state at entry and mapped them down to the surface to get an idea of how close we were coming to our target site. We represented our confidence in the solution by multiples of something called "sigma". The greater the number of "sigmas" you use, the higher is the probability that the spacecraft would land inside the red (or other colored) ellipse. A "1-sigma" ellipse represents a 39% change of landing inside the ellipse area while a larger "3-sigma" ellipse represents a 99% chance. The uncertainty ellipses grew smaller as we got closer to Mars and, ultimately, became much smaller than the target (blue) ellipse of 200 x 100 km. In fact, I am able to show only 3-sigma ellipses from solutions within the last week before landing. But that's just part of the story - the centers of the ellipses also moved around with time. We kept tracking the spacecraft and doing trajectory solutions and we saw the predicted landing point wander around a bit. This was expected. The motion slowed over time and the solutions during the last 24 hours before landing were very stable, mapping very close to the same landing locations. The red ellipse on this image represents a navigation solution using all tracking data from February to July 4, 1997 at 15:30 UTC (just prior to atmospheric entry). It represents our best navigation solution to date. The ellipse has shrunk to its smallest size since we have incorporated data from all 3 DSN sites during the last 24 hours. The data from the DSS 65 pass (in Madrid, Spain) beginning about 4 hours before landing is especially powerful. The ellipse represents the 3-sigma uncertainty and is 15 x 8.4 km (9.3 x 5.2 mi) in size. The ellipse is centered at 19.22 degrees N and 33.4 degrees W (326.6 degrees E). This is about 22 km (14 mi) from our target latitude and longitude. The green and yellow X's on this image represent two different post-landing solutions for the landing site. The yellow X is the lander location derived from triangulation of features (large rocks, crater rims) visible in the pictures taken by the lander camera. 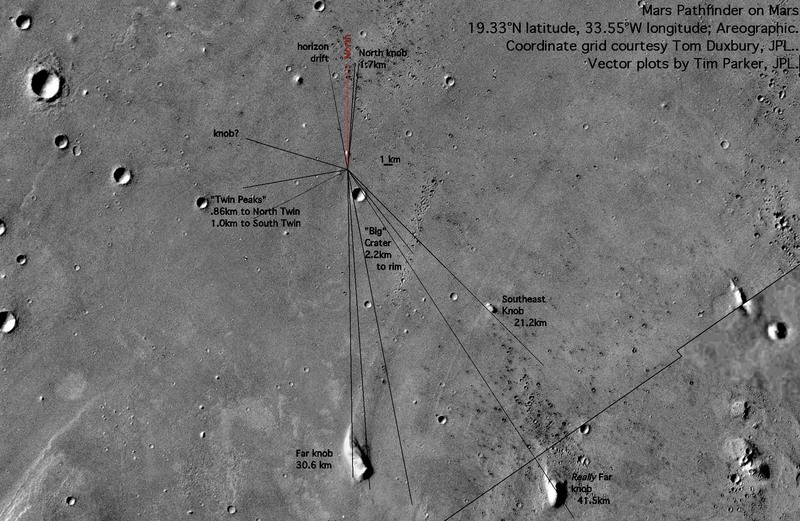 (Here is an image zooming in on this region at higher resolution and pointing out some of the landmarks used to locate the spacecraft's position.) The green X is a (very) preliminary estimate of the lander location based on tracking data obtained from the lander in the first 2 days after landing. (Yes, we are still getting Doppler and, occasionally, ranging from the lander on the surface of Mars.) The points marked by the X's are roughly 27 km (17 mi) from the target latitude and longitude. As you can see, there is some disagreement between our final navigation solutions using data before landing and estimates of the landing site using data after landing. This is not at all unusual. There are many assumption and models that we use to relate locations in interplanetary space to locations on the surface of a planet. Small errors or changes in any of these could account for this discrepancy. This just means we're not quite out of a job yet :-) We are now working with the science teams to resolve this. When we figure it out, I'll let you know. These are listed in order of decreasing size. FYI, only the first parameter update was sent to the spacecraft and TCM 5 was not needed. The 7th ellipse - yellow (5,smallest) - represents our best solution using all of the pre-landing tracking data. It was done around 1 PM on July 4, after our successful landing. This solution was done on 6/30/97 - 4 days before landing and 5 days after the execution of TCM 4. As you can see from the position of the red ellipse, we were still on target for the desired landing site. The ellipse represents the 3-sigma uncertainty and is 179 x 68 km (111 x 42 mi) in size. The ellipse is centered at 19.5 degrees N and 33.1 degrees W (326.9 degrees E) - once again, pretty close to our target of 19.43 deg N and 33.1 deg W (326.9 deg E). The solution was done on 6/26/97 with a little less than 24 hours of tracking data taken since the execution of TCM 4. As you can see from the new position of the red ellipse, TCM 4 had moved the spacecraft back on target for the desired landing site. The ellipse represents the 3-sigma uncertainty and is 219 x 73 km (136 x 45.4 mi) in size. The ellipse is centered at 19.45 degrees N and 32.88 degrees W (327.12 degrees E) - that's pretty close to our target of 19.43 deg N and 33.1 deg W (326.9 deg E). This solution was done on June 23, 1997 for the final design of our 4th maneuver, TCM 4. It put us just outside the blue ellipse at latitude 20.04 degrees N and longitude 31.43 degrees W. Our uncertainties were small enough to display both a "1-sigma" and a "3-sigma" ellipse. The "1-sigma" ellipse represents a 39% change of landing inside the ellipse area while the larger "3-sigma" ellipse represents a 99% chance. The "3-sigma" ellipse is 186 km X 73 km (115.6 x 45.4 mi). TCM 4 was designed to move the center of the red ellipse on top of the red diamond - the target landing site. This figure illustrates Mars Pathfinder's target landing ellipse projected on a map of southern California. The ellipse is 200 x 100 km in size and is centered on Pasadena (where JPL is located). The ellipse is oriented so that it falls on the land mass of southern California. If oriented at the same angle it takes on Mars, the ellipse would extend out into the Pacific Ocean! Click on the image if you want to see the full-size map showing the entire state. The map of California used for this illustration was created by Ray Sterner at APL/Johns Hopkins University and is used with his permission. Similar maps for all 50 states can be found in his color landform atlas of the U.S.